I have to be honest here – I’m not big on disliking people. I’m just not. I’m not saying this to make myself out to be some kind of saint. In fact, sometimes I feel like it would just be better to be more in sync with my gut when it comes to writing about certain figures in the fight game. I say this because there are guys out there who just seem to beg writers and fans to lash out at them. 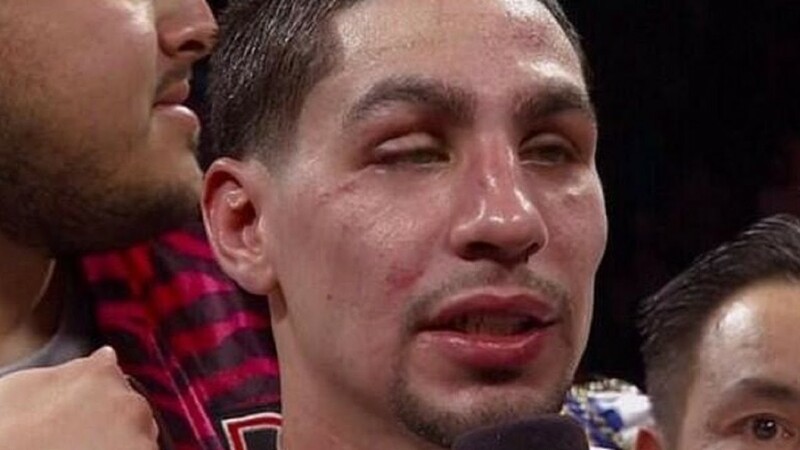 And Danny Garcia, I openly admit, is one such individual. Here’s a guy who every one seemed to love in 2013 after his victory over Lucas Matthysse, but who then took that love and turned himself into a heel in under twelve months. First there was 2014’s “homecoming” fight in Puerto Rico – a place Garcia, if memory serves me correctly, had never even been to. If only we could all have homecomings in places we’re only connected to by virtue of our DNA. I myself could visit Ireland, Lithuania, England, Holland, and probably some other places too. Sound absurd? It is – just like Garcia’s fraudulent homecoming was absurd. If only the nonsense had ended there. Sadly, it didn’t, for that homecoming ended with the Philly fighter being awarded a victory he clearly didn’t deserve. Let’s face it, Mauricio Herrera beat Garcia hands down that Saturday night in the Caribbean. I know it – and if you saw the fight, you do too. Not that it mattered. Everyone knew it was Garcia’s show and barring a knockout, Herrera probably wasn’t walking away with the win. Garcia’s face didn’t suggest he won the fight with Herrera. Yet that sort of thing was simply grating to those who took the sport of boxing seriously. Rather than trying to endear himself to boxing’s fan base afterwards, however, Garcia decided to fight Rod Salka next in a bout that I believe verged on the criminal. Broadcast live on Showtime in the summer of 2014, the match featured Garcia against an unranked, unheralded and largely inexperienced lightweight. The fact that Garcia was a junior welterweight at the time tells you all you need to know. Even writing about that bout now, so many months later, boils my blood. Garcia brutalized Salka by slamming his fist against the man’s head in overwhelming and disturbing fashion, putting his opponent down and out in no time. I suppose we should all just be happy Salka was able to get up afterwards. And to think there were opponents out there like Lamont Peterson who Garcia could have faced that night instead of his overmatched victim. Outrageous. Garcia did get around to fighting Peterson this past year, of course. The two men met at a catchweight, which naturally made things easier on Garcia, and none of his belts were on the line – another convenience. Garcia ended up getting the win (surprise), even though I clearly thought he lost the bout to the slick and skilled Peterson. 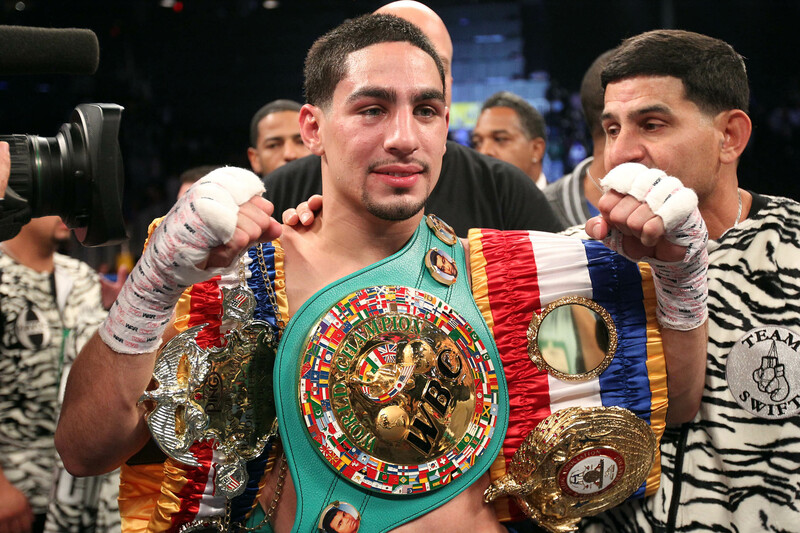 Hey, it’s good to be Danny Garcia! Garcia earned the decision against Peterson, but he failed to impress. Now we have “Danny Swift” on the verge of facing Paulie Malignaggi, a speedy, frustrating veteran with a knack for making well-regarded opposition look bad. Just ask Adrien Broner and Zab Judah. Many think this is a cupcake fight for Garcia, since the last time Malignaggi fought he was decimated by Shawn Porter. I disagree, however. I actually think Malignaggi can present Garcia with real problems. And that leads to what I like to call the flip side of the Garcia coin. Although Danny’s turned himself into a WWE villain of sorts, there’s still a lot to like about the guy. Believe it. For starters, he’s faced – and beaten – extremely talented opposition over and over. Matthysse. Amir Khan. Zab Judah. These aren’t opponents that coddled fighters rise to the top by battling. Garcia got to where he is the hard way, make no mistake about it. He may be top dog now but he arrived here by being the underdog. Let’s also keep in mind that Garcia is fun to watch. He’s never boring and he brings the heat each and every time out. Perhaps most importantly, Danny finds a way – at least until recently – to defeat arguably more talented men. Look at the Amir Khan fight for evidence of this. Khan was faster, possessed better ring generalship and was pretty much owning the gritty kid from Philly. 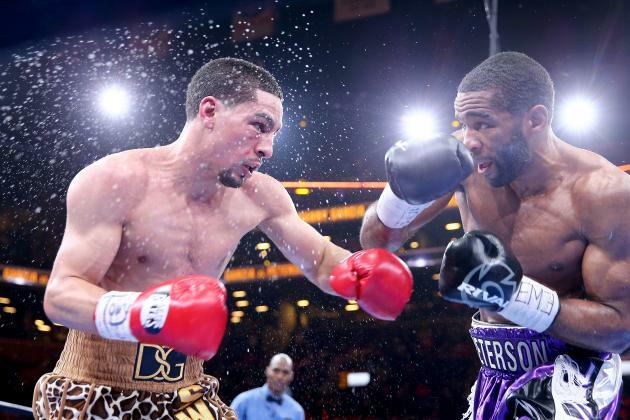 Garcia is expected to beat Malignaggi, but what version of Danny will show up? Then he got knocked out. Garcia found a way to make it happen. That’s what’s still likeable about the guy. He may get the kid glove treatment these days, but Garcia is still the most rugged man on the block. Even if he somehow loses to Malignaggi, I fully expect Garcia to get back in the ring and keep grinding along. The guy’s a fighter, plain and simple. Just how good a fighter is he? In my opinion, his last three performances have essentially been disappointments. Indeed, Rod Salka is the only opponent Garcia has been able to dominate soundly in almost two years. To take things a step further, one might as well ask just how great Matthysse is. I know action fans love the Argentine. I do, too. But just how talented is he in comparison to others in his loaded weight realm? Add all of this to the vulnerability Danny showed against Khan, who was cruising along until Garcia caught him, and legitimate questions come to mind regarding his potential for superstardom. Until recently Garcia has found a way to win fair and square. And that’s the Garcia I hope to see fighting Malignaggi and all future opponents. I’d rather a “B” fighter give fans their money’s worth than I would see a “B” fighter falsely presented as an “A” fighter. No more Rod Salkas, okay Danny? We liked you better before the days of catchweights and bogus homecomings. The Danny Garcia of recent years hasn’t lived up to the underdog that fans once appreciated.